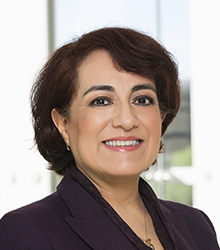 After finishing all seven of her postdoctoral training programs, Dr. Chévez-Barrios joined the faculty of the Baylor College of Medicine in 1996 as an Assistant Professor in the Department of Pathology, with a secondary appointment in the Department of Ophthalmology. She became a Clinical Assistant Professor in the Department of Ophthalmology there in 2004, and received the Fulbright & Jaworski LLP Award for Faculty Excellence in Teaching and Evaluation and became Associate Member of the Cell and Gene Therapy Center that same year. She has current appointments of adjunct professor in the Department of Pathology at The University of Texas MD Anderson Cancer Center and Department of Ophthalmology at the Baylor College of Medicine. Dr. Chévez- Barrios assumed her current positions at Methodist in 2004. The main research interest of Dr. Chévez-Barrios and her laboratory is the study of retinoblastoma, including cancer stem cells, suicide gene therapy for retinoblastoma, the study of metastatic properties of retinoblastoma and preclinical models of the tumor. Other topics of interest are ocular gene therapy, cataractogenesis, vascular proliferation in hypoxic ocular diseases and corneal diseases. Dr. Chevez-Barrios’ laboratory is currently participating in the project of gene therapy for Retinoblastomas in collaboration with the Texas Children’s Cancer Center and the Center for Gene Therapy of Texas Children's Hospital, and Baylor College of Medicine. Pre-clinical studies and a phase 1 clinical trial of vitreous seed of retinoblastoma have been completed. The phase II clinical trial is in preparation. Dr. Chevez-Barrios is a committee member responsible of evaluating all enucleated eyes from the prospective multicenter study of the ARET0332 Children’s Oncology Group protocol on “A Study of Unilateral Retinoblastoma With and Without Histopathologic High-Risk Features and the Role of Adjuvant Chemotherapy. Dr. Chevez-Barrios is also interested in the biological differences between retinoblastoma cell lines that have the capability of producing metastasis, and those that behave less aggressively and remain as intraocular tumors.